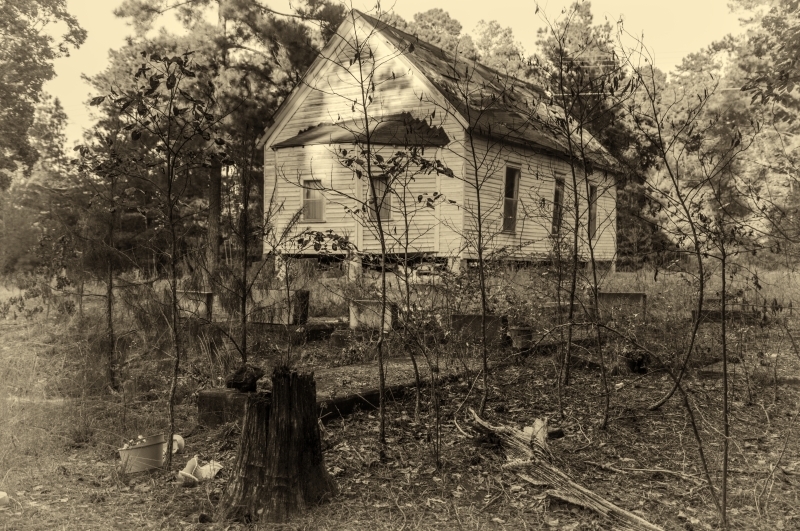 We know very little about St. Paul Primitive Baptist church, located in rural Terrell County in Southwest Georgia. 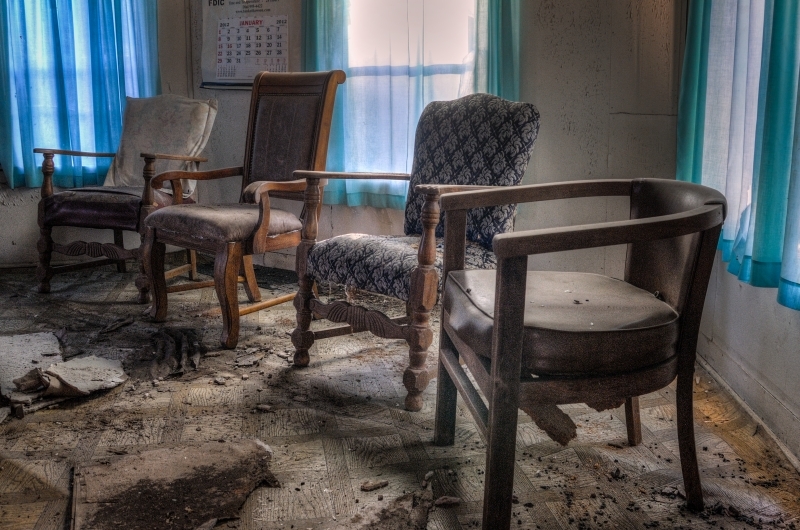 Decayed churches like St. Paul are a sad, but all too frequent, reminder of the hard life and struggles that were associated with those parishioners who were trying to carve out a life for themselves and their children in a post Civil War land that lay in ruins. 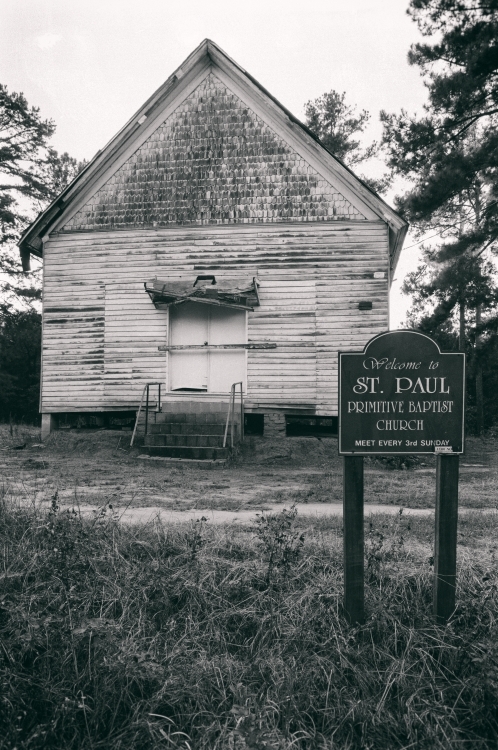 African American churches like St. Paul emerged all across the south where sharecropping was the primary way of life in an agricultural economy that would slowly diminish as Georgia began to develop cities and an industrial base. As a result, many African Americans participated in a mass migration to the cities and the industrial centers of the north to seek a better life. For those that stayed, life was hard but the church sustained them as the center of spiritual comfort and social interaction. We are fortunate that our photographer was able to capture these images of the deserted church back in 2016. The sequence of the photos below are moving images that remind us of this pattern of our history that is so important yet so difficult to document. The last photo in the sequence was taken in 2018 and inspired us to create a new category we call “Almost Gone But Not Forgotten”. 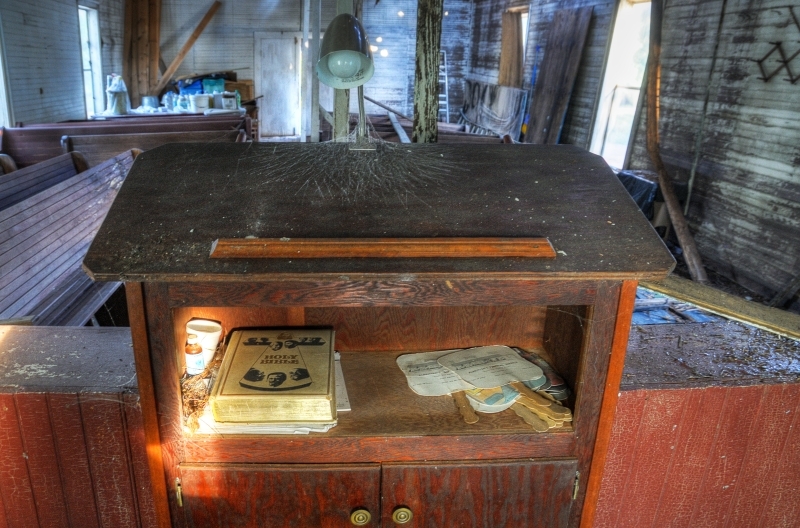 Much of this rural church history that is now rapidly fading is very difficult to find, but we are hopeful that some will emerge as a result of the publicity that we can generate. We encourage comments below and any contributions someone might be able to make. We do not know when St. Paul was built or when it became inactive and abandoned. It is old and our guess is that it dates back a hundred years or so. Shortly it will be completely gone without a trace. But although she is almost gone, she is not forgotten. We can see that St. Paul fits into that category of small rectangular single room house of worship. Resting on brick piers, St. Paul embodies the image of a rural church. The building only goes as far as sporting a textured shingle surface under the front gable for ornamentation. Overall, St. Paul gives off that air of importance through its rustic yet simplistic beauty. Unfortunately, the roof of St. Paul was compromised at some point in the past, leading to the deterioration of important structural members. With historic structures like St. Paul, structural issues concerning the roof often result in devastating and long term building conservation problems. 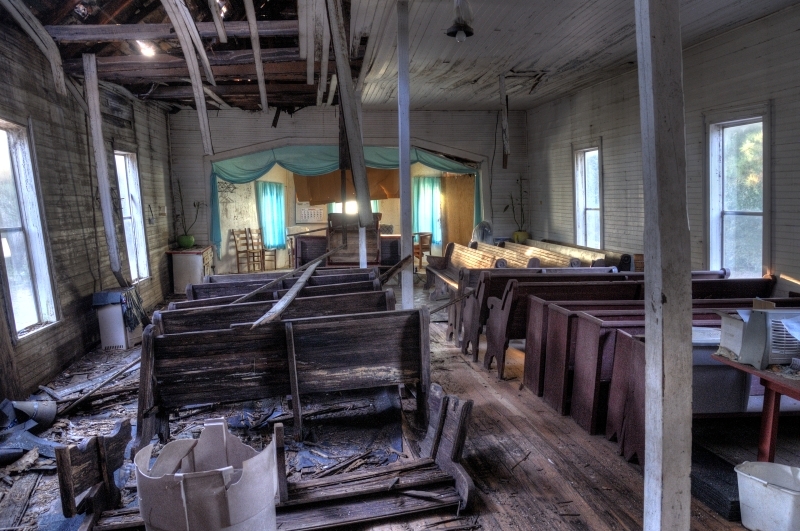 The result, over a two year span, was complete collapse of this historic rural church. Although rural, although simplistic in many ways, the craftsmanship and attention to detail is always present throughout Georgia's historic rural churches. St. Paul is no exception. 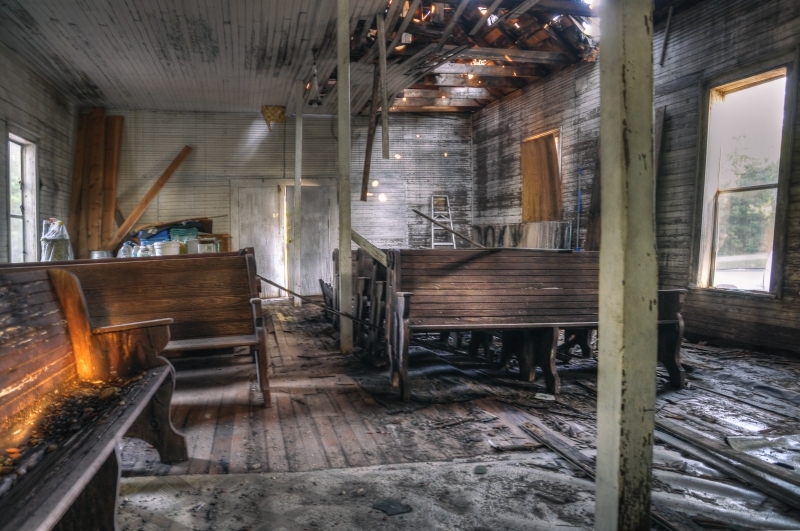 The detailing of the pews and overall interior of St. Paul were a testament to the importance of religious life across rural Georgia. 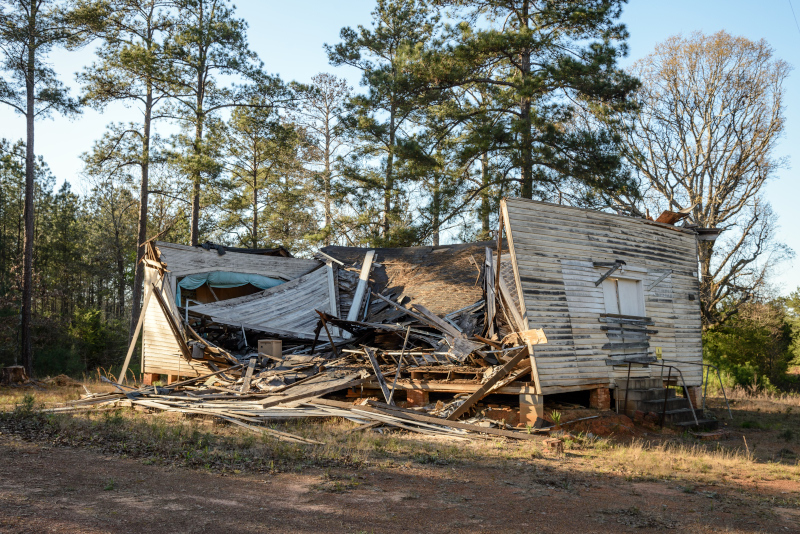 From 2016 to 2018 St. Paul Primitive Baptist experienced a dramatic demise. 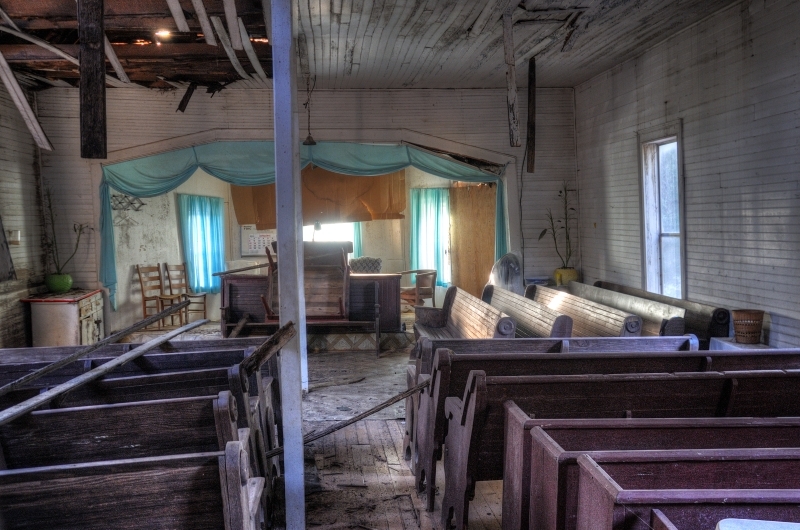 Over that short span, the building transformed into the perfect example of an Almost Gone But Not Forgotten rural church. All too often, we see this slow fading away process occur across the state. All we have left are stories and images but they paint a beautiful picture. 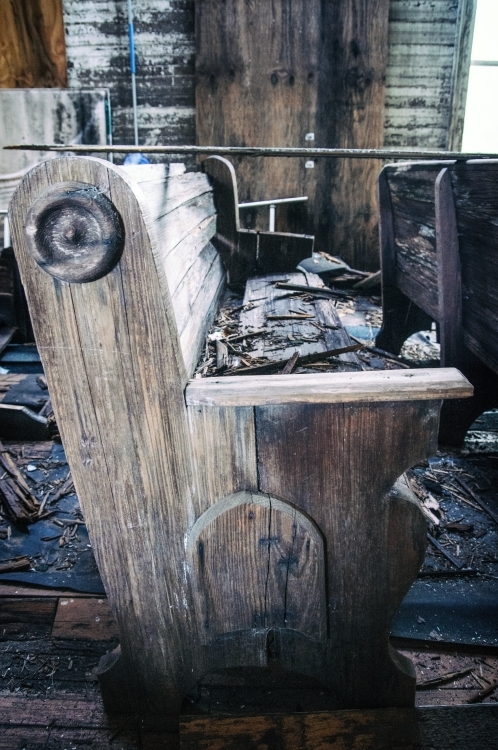 Can any of the old pews and other interior pieces be saved and put away for restoration? Someone may have saved them but we don’t know. They will probably disappear with everything else. Sorry, I don’t know anything about this church. I was wondering what the date is on the calendar I see on the wall in back of the alter. I would think that would be a clue to the last year it was used. Very sad story. I hope someone saved some of the pews. They were probably made out of heart pine and maybe the floors. I enjoy your church pics and descriptions. Thanks Linda. Good thought about the calendar.